Claudia’s Busy Year, plus Highlights for Other Nikkei Competitors – Congratulations Everyone! These are excerpts from the Nikkei Centre’s Monthly Read, written by Sensei Mert Horita, shared by Claudia. PKF (Panamerican Karate Federation) Championships. Due to the Texas Hurricane Harvey, Claudia and Andreas were stranded in Argentina for a few days. Their flights through Houston were cancelled. Our affiliated Argentina club members kindly looked after them. Our top competitor Claudia Laos-Loo is having another very busy schedule this year. 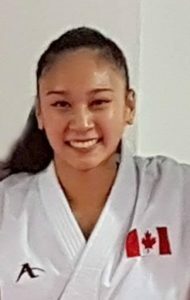 Claudia started the year at the Canadian National Championships in Quebec winning both the Gold in Kata and Kumite, a remarkable feat since most competitors are specialist in only one or the other. Next stop was the Dutch Open in Rotterdam in March then to the National Training Camp in Toronto. Then the USA Open & Junior International Cup in Las Vegas in April. Claudia stayed local in May to take the Gold at the Steveston Tournament. 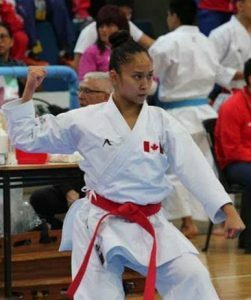 In June, she competed at the Canada Open Karate Championships. In July, she was at the World Cup in Croatia. This August saw Claudia competing at the Championships in Buenos Aires, Argentina. Her current schedule will see her at the World Championships in Santa Cruz de Tenerife, Spain in October and the Okinawa Open in Japan in November. Claudia started her karate lessons at the age of 7 at Ladner Karate and now trains at Nikkei Karate. Her coach, Sensei Junya has been the expert behind Claudia’s success. Sensei Hiroshi Ota is a karate-do instructor at Keio University in Japan, and he met Sato Sensei about ten years ago in India.